I know Awkward & Awesome is historically a Thursday event, but with the popularity of Throwback Thursday, #tbt for those in the know, I think A&A needs a new date! So let's talk some A&A today! - Having a sunburn & an obvious white "W" on my back... guess that is one spot that I could reach...? - Getting caught taking outfit photos by a police officer & told to leave... I so did not want to have to explain what I was doing! Guess my secret spot isn't so secret anymore! - My bestie was in town this weekend & we ate, drank, boated, & tried on Wedding Dresses!!!! This whole "I'm getting married" thing just got real, in a super awesome way! - The boyfriend fiancé (<-- I need to get better about that!) just brought me a glass of the beer he personally made for me... YUM! - These new ShoeDazzle sandals (the "Danee")! When I first got them they were a half-size too big, but these perfectly fitting babies just arrived at my doorstep & they ain't ever leaving my feets! Other things that are awesome!? Giveaways! What has been awkward & awesome in your life friends?? You forgot something on your awesome list. You in this absolutely adorable outfit! Love those shoes too. I've always had a fear that a cop would come by and ask what we're doing... uhhh awkward! Love the combination of the leather shorts and the tie front shirt! Hope your air conditioning gets fixed soon. Trust me, I know first hand how horrible that can be! You look so great! I'm LOVING those shorts–and eek, sorry about your AC being broken! 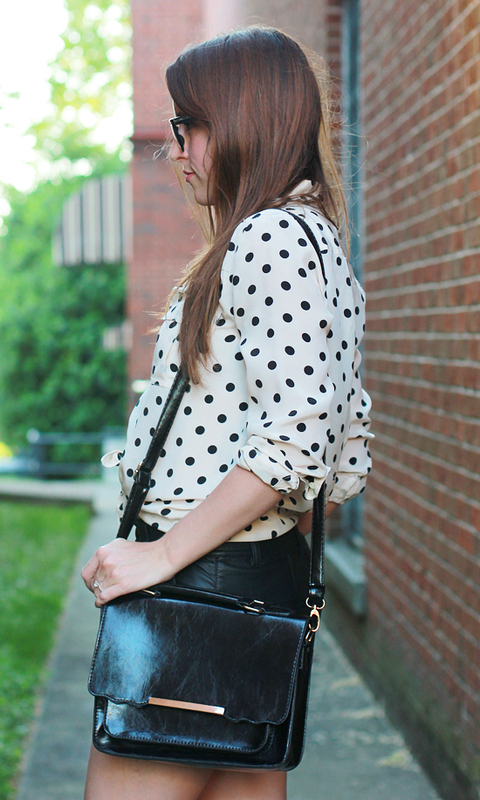 Your polka dot top is adorable! That wedding dress you tried on is stunning on you! What a funny story that a cop asked you to vacate your photo locale - doesn't he know you are doing some important things there?! :) You look absolutely awesome! I don't have AC in my house. Pity me, Jessica! haha but seriously you look great here! Hilarious that you got caught taking outfit photos! You don't have AC... Like ever!? Oh my goodness! You strong woman!! I am loving your hair lately! and such a cute outfit!! Dude, when I got salon gel manis they did not bode well in water. I always found myself in the corner of the pool picking at the edges isntead of socializing (okay, this was usually after too many beers). Also, think I might get those shoes. Your future hubby made a beer for you?! how fab!! Sorry about your a/c, hope it gets fixed soon. And are those shoes comfy? They look super cute! I love that outfit and that bag!! I ordered some shoedazzle heels and can't wait to get them in! I really love this outfit on you!